Court Liaison Activities: Responsible as the Liaison to the court system, including Rhode Island Superior Court, District Court and Family Court. Coordinates arraignments, pre-trial hearings, trials, and other legal proceedings, along with the scheduling of police officers, victims, and witnesses. Victim/Witness Assistance: Coordinates the department’s victim and witness assistance program, to include: the initial point of contact and follow-up activities; updating policies governing the implementation and delivery of victim/witness services by department personnel; delivering information to victims and witnesses about the status of cases and their roles; liaison officer with other victim/witness agencies. Prisoner Transportation: Responsible for developing and monitoring policy and procedures related to this activity, and to ensure compliance with this function. Legal Process: Responsible for the delivery of legal process documents. Documents the proper and timely delivery of all legal documents, and ensures that all legal requirements are met. Domestic Violence Coordinator: Responsible for the administration and operation of all functions and activities related to the follow-up on victims of domestic violence; reviewing and maintaining files for domestic violence crime reports; serving as an advocate for victims of domestic violence; and providing information and assistance to the public on domestic violence, programs, and other domestic violence related matters. These functions and activities shall be accomplished by utilizing Patrol Officers who may be assigned additional Domestic Violence Advocate duties. 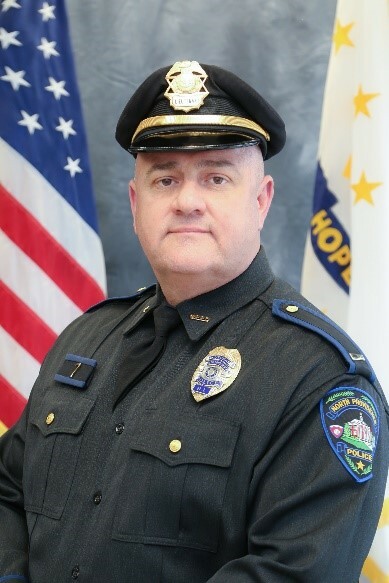 Copyright © 2019 North Providence Police Department, North Providence, Rhode Island USA. All Rights Reserved.